A Joint venture with Rotary Club of Solon, Rotary Club of Santa, Tecla, Rotary International, St. Dominic’s Catholic Church and AB Project Manager. In 2014 Rotary Club of Solon made its first visit to Chiltiupan, El Salvador, the poorest city in a very poor country. The trip was made with a representatives of St. Dominic Church, Geraldo Bowers, on a trip with educators to see the City and get an idea of what we could possibly do to help poor people get water. This trip we toured the sustainable farm cooperative, which led us to poor Cantoon adjacent to the farm. In this Cantoon there were about 200 people that desperately needed water, but it was too few people impacted to qualify for an International Rotary Grant. The first trip we were graciously received by Santa Tecla Rotary of San Salvador, El Salvador. They pledged they would provide any local support needed to get the project done. In early 2015 the idea came up to drill a well for a sustainable farm cooperative that teaches El Salvadorians to grow many different kinds of crops, focusing on crops besides potato’s and corn, that would produce impact to 1000’s of people, while delivering water to the 200 people in the local Cantoons. We planned another trip, but this time we included a member of engineers without borders, and took an exclusive trip to explore this option of supplying water to this location. On this trip we discovered through a local engineer that water was readily available only 60 feet down in the stratifications of water in the mountain, that would not disappear in dry season. In dry season crops were dying, and the local people had to travel up to 3 hours round trip to retrieve water. It seemed like an ambitious venture, but we came home and went to work. It took us nearly two years to get the grants, develop the plans, hire a project manager, and hire a contractor to build our plan. Rotary Club of Solon raised $18,000, which the project was matched by the regional grants committee for, and then Rotary International awarded a grant to match all the money raised for a grand total of $72,000. In late 2017 we had all approvals in place, but had to wait for rainy season to be over so we could get the large equipment needed 4 kilometers down the mountain side to the farm property. We started construction in April of 2018. Work was delayed by needing additional information required by Rotary International, by weather, and change orders. We even had to widen the road to get the equipment through to complete the work. What had seemed like a solid plan had some issues that were not included. The topography of the land required different placements of water holding tanks than we originally anticipate. We ended up moving one of the tanks an additional 300 yards up a hill so the water could get further than originally anticipated. Despite all the delays and problems, the well is drilled an operational. We will still need to lay down more piping to deliver the water to the some of the originally planned locations, but this work is simple in nature, and will be completed shortly by the original contractor and help from the locals. By late September we got a report back that our well was pumping water at 40 gallons a minute, and the quality of it makes it drinkable without any filtration. We are creating a great amount of pressure in the system allowing us to reach further distribution points. On November 4th, 2018 there was a blessing of the well offered with a celebration of the families benefitted, and many others from the Town of Chiltiupan. We were blessed to see the faces and eyes of the people we are helping. They through us a great celebration including a mariachi band, wonderful homemade hen soup, and of course cake. There was a lot singing and dancing, and we realized what a major impact this will have on all their lives. Instead of spending three hours a day getting water 6 months out of the year, they will simply turn a tap for fresh potable water. They will be able to grow vegetables all year long. They will be able to wash their clothes and bathe with ultra clean water. The sustainable farm will may now expand its offerings to Papaya and Mango cultivation. In dry season there will also be plenty of water for the plants in the greenhouse areas and beyond. As we were greeted so warmly by all the people we came to distinct realization that we not only helped a great group of people, but they actually helped us as much or more than we helped them. Their humble, grateful attitude will be forever in our hearts, and provides us with additional drive to help others. God Bless all that participated in this project, we are seeing it through to the end. Finally the plan to ensure sustainability has been planned and will be executed one initial usage data is available. In the process of developing the plan and pulling together the parties to help, we realize that we never had a kickoff meeting to put everyone on the exact same page with a common goal. The people running the project all had the best intentions and did a great job, but we could have provided better leadership and avenues of conflict resolution. In El Salvador it is not customary to ask for change orders. Decisions were made that were in the best interest of the project, but not communicated as to what they were. Some of these changes required small amounts of additional funding, but that turned into delays because people did not know where it the funding was coming from. 95% of the money needed was already there, and very small problems boiled up to larger issue that cause delays. Just like running a business, communication and honesty is key to a success, and key to a functioning team. In the end all came out with positive results. We will complete the project in the next 30 days, and the people are relieved they will finally have clean water. Xenia Perez of Balsimo AB management company. Jodie Bowers, our St. Dominic contact that brought all these people together. Our translators Ania and Aristades that stuck by us and kept calm even when things got a little sticky. Santa Tecla Rotary for all their administration of the project, and the open arms when asked for help. Solon Rotary Club Brothers and Sisters than helped us raise all the funds and give us emotional support to get the job done. Our Poster Child Geraldo (pictured) who was not even quite born yet on our first visit in 2014, and his wonderful family. 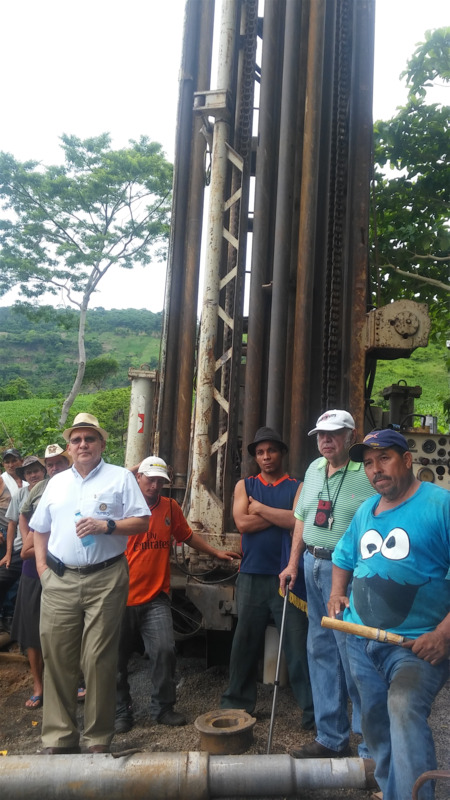 The owners and operators of the cooperative that provided additional volunteer labor to get the job done in budget, and for their continued support to organize sustainability of the well. This was an experience of a lifetime that has impacted so money people in so many ways. We are proud of the work and the results.